Since John and I started teaching music to young people in the Council area, we have become aware that a genuine need exists for financial aid to students whose families are struggling to make ends meet. 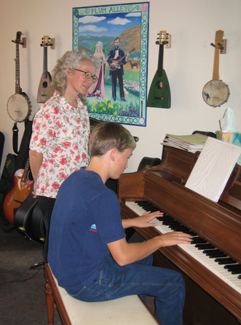 Adding the full cost of music lessons to very tight budgets can be a real hardship for these families. The Plum Alley Music Scholarship Fund is intended to make it possible for students of families with limited disposable income to take lessons at a significantly reduced rate. Donations to the scholarship fund go entirely toward the cost of lessons and are tax deductible. The Council Cultural Arts Committee, an Idaho non-profit 501 (c) 3 organization, administers the scholarship. The scholarships are awarded on a yearly basis to as many students as funding allows and cover up to 70% of lesson cost. Supporting the music education of young people is one of the best ways to support the growth of community participation in music and music events. A growing population of young musicians brings many other community members into the realm of music, and creates a stronger foundation for the continuation of music as a vital part of the community’s recreation. For students who will continue their music education at a secondary level, the training in theory and music history offered by Plum Alley Music will help them with future classes. Eberle Umbach and John Hayes have been teaching music in the area for ten years. For the past three years, Plum Alley Music has had a special focus on younger students; during this time we have had an on-going studio of around 20 students, including children and adults. Eberle and John both have backgrounds in classical music as well as jazz and other popular forms. In addition to performing and teaching in the region, we have both received grant funding from the state for music composition and performance projects. Most recently, the Idaho Commission on the Arts and the Idaho Film Collection have provided us with funding for silent film score composition and performance. Our goal at Plum Alley Music is to be a community resource for music education.